After being accepted into the University of Sydney, I began the process of becoming an international student, something I had never done before. Between banking, visa, finding a place to live and picking classes, it required a significant amount of online research, international phone calls and applications. But ultimately it was all worth it. Eight months later, after saying goodbye to my family at the train station, I began a journey that took me from Ottawa, Ontario to Toronto, Ontario. Next, I took a plane from Toronto to Los Angeles, California and from there I took the overseas flight to Sydney. I landed on July 25th, 2018: day 1 as a Sydneysider. After I arrived at my accommodation, figured out my first meal and let my family know I was safe, it was time to go exploring. I had five days between when I started classes and when I arrived and wanted to take advantage of the time I had. I toured the university, Circular Quay, Darling Harbour and the Rocks. I took the bus to Bondi and did the coastal walk to Coogee and back; and I checked out the neighbourhoods around me. I wanted to familiarize myself with the city I now call home and get settled in. But when school started, I had to shift my attention and begin focusing on school once again. As I am now 2/3s of the way done the program, I can safely say I am in the correct program for my interests. I am currently taking classes on Australian public policy (the Australian focus was a great lens to learn about Australian policy and government), Health and Security and a ‘One Health’ seminar. In my classes I examine how animal, human, and plant diseases spread, the militarization of disease outbreak response, and the policy backbone of society. The University of Sydney is incredibly special; with the number of schools and facilities it houses, I can take classes from several perspectives. I have access to classes in the school of veterinary science, the school of medicine, the school of agriculture and earth sciences and the school of government and international relations. This multi-disciplinary look at health and infectious diseases is eye-opening and illuminating, offering, what I hope to be, a great foundation on which to grow a career. As my first semester ends and the number of papers I must complete adds to the stress, I know I am only a short distance away from a breathtaking view or a wonderful oceanside stroll. I have been fortunate enough to take part in several activities to ease my transition into Sydney and get my mind off school for a while. 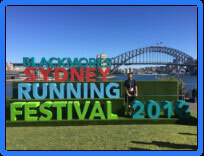 I was able to take part in the City to Surf run, the Sydney Running festival and even got out of the city for a weekend with a ski trip down to Thredbo and Perisher. I am forever grateful for the opportunity that the University of Sydney, the city of Sydney, the Rotary Foundation and clubs in Australia and Canada have offered me. While only being a resident for two months thus far, I am incredibly happy and proud to be a Sydneysider.